OtterBox is a well-known company for their cell phone cases. We have certainly completed many reviews on their products at The Geek Church. The most recent review was an offering for the iPhone X. 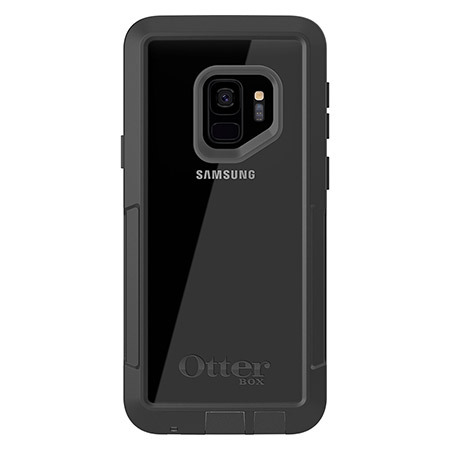 The new Samsung Galaxy S9 can also be protected by OtterBox. Today’s review is for the OtterBox Pursuit series. The Pursuit case promises by Otterbox to be “the thinnest, toughest, most protective case” of their products. It protects from dust, mud, dirt and snow. It’s not waterproof, but the Galaxy S9 is waterproof in and of itself, so that feature isn’t really needed. It has Otterbox Certified Drop Protection with a limited lifetime warranty. Although there is the raised, beveled edges on the front of the case to help protect the screen, it is recommended by many reviewers out there to get a screen protector for full protection. Many screen protectors will work with this case. There are nice cut outs to fit your cords and such, and the one on the back for the fingerprint sensor and cut well to prevent the flash reflection. There is a chamber at the bottom of the case to pull the sound to the front- giving an enhanced audio feature in the case. The buttons are easy to manipulate. If this kind of protection is what you want for your phone, it comes with a steep price-tag. It costs about $70, and you can buy it on the OtterBox site in three options of colors. It comes in black, black with a clear back so you can see your phone through the case, or Coastal Rise- which is pink with black accents. OtterBox was generous enough to send us this case for free in exchange for a fair and unbiased review. No other compensation has been provided.